The second season of the mega singing talent hunt show Arunachal Idol begun today. 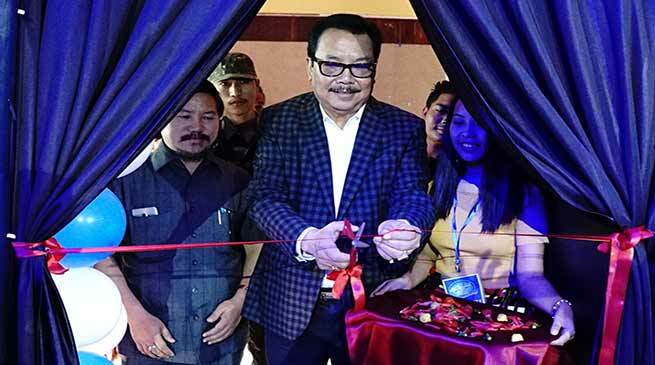 The Deputy Chief Minister Chowna Mein flagged off the event amongst ecstatic zeal and grandeur at Siddhartha Hall Itanagar. Inaugurating the event Dy CM said that hard work is the only mantra for success. There may be one, two or three winner in the event but we have to never mind as today the 202 contestant who came after winning the district auditions are all winners of Arunachal Pradesh, the Dy CM said. Mein added that Arunachal Idol has given the right platform to our budding artist to showcase their talent. Their aim in identifying the abundant raw talent available across the state and to help these deft performers to further develop their talent is really commendable. Arunachal has no dearth of talents be it singing, dancing, sports or in any activities but due to lack of proper facilities or platform our young talents goes unnoticed and the need of the hour is to create such facilities in our state, the Dy CM further said. Extending his best wishes to the contestant, he advised them to perform at par from one another and proof their talents to win millions of heart in the state and country through their sensational voice. He congratulated the organizing committee for organizing such talent hunt show in state and wished for the success of the event. Citing Arunachal as the land of pristine beauty, the Deputy Chief Minister said that the State should also be known as a land of songs and dances. Be it any occasion in the state, our every program is always full of songs and dances and without it our programs are not successful. Parliamentary Secretary Home Pani Taram who is the Chief Patron of the event said that the contestants are the future of music and good to see so many talents coming together from various districts to showcase their talent and pitch their skills against one another. He also extended his best wishes to the contestant and the organizing committee for successful conduct of the event. The Second Season of Arunachal Idol Singing Talent Hunt organizing committee Chairman, Mallo Attu gave a brief presentation on journey of Arunachal Idol. He informed that Arunachal Idol has selected 202 budding singers from around the state, after holding auditions at six different zones and from each zone only 50 participants are selected for mega audition and only 12 singers from mega audition will be selected for competition round who will be competing for glory on Arunachal Idol. On the two point memorandum submitted by the Committee Arunachal Idol, HDCM Chowna Mein gave assurance to place the demand for sanctioning/allotting a permanent studio for shooting reality shows in the next budget and with regard to declaring the Arunachal Idol as calendar event of the state, he assured to take up and discuss the matter with Chief Minister Pema Khandu, Cabinet Colleagues and with Officers of Department of Tourism. Earlier, Dy CM Chowna Mein accompanied by Parliamentary Secretary Home Pani Taram inaugurated the Arunachal Idol Studio. Renowned singers and youth icon of the state like Jeli Kaye, Karry Padu & Nonkham Lakhum will be the judges for the event. Youth icon of the state Jeli Kaye, renowned singer Karry Padu and winner of Season 1 Arunachal Idol Pokg Karbak with their Bollywood numbers and local song mesmerised the crowd.